One might suggest that buildings can be separated into those designed to read as the method in which they are constructed and those designed to hide or be elusive to the construction method. Likewise, a construction method may also be a stereotype for the type of building one might expect to view. When considering the nature and art of tilt-up construction then, a true statement is “the vast majority of tilt-up buildings are composed of full-height concrete panels spanning from the building foundation to the roof diaphragm.” This means that the stereotype for the built environment in tilt-up construction is a single-story structure with large, expansive walls and an innocuous or industrialized aesthetic. As crane sizes have increased and availability become more economical, taller tilt-up panels have kept this true to form for even multistory tilt-up buildings. Yes, with every stereotype there are clear and definitive breaks that set the stage for a fresh conversation. One such conversation can be entertained in certain markets where vertically stacking tilt-up wall panels, top to bottom, to create multistory structures is an increasingly popular strategy. Many times crane size and availability, as well as bracing economy or structural efficiency, can lead a project team to desire shorter panels stacked to the required building height. However, building aesthetic or architectural style may also play a large part in determining this direction. Regardless of the impetus for the decision, there are two major options when choosing this method. Both have been around for a very long time, both have their advantages and disadvantages and both, as evident by the low number of examples, remain relatively underutilized by the global tilt-up industry. The two options are stacked-structural (or loadbearing) envelopes; and stacked-cladding (or non-loadbearing) envelopes. 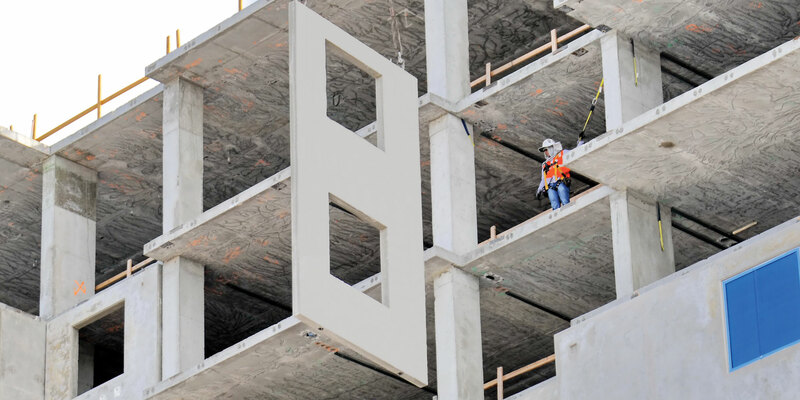 In Texas, Florida and Ontario, project teams utilize stacked, loadbearing panels on projects of four-, five- and even six-story office buildings. 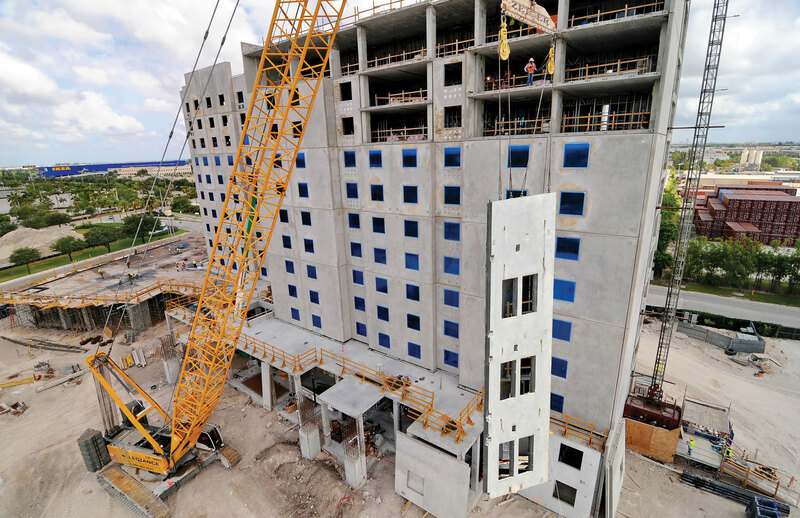 In Florida, stacked non-loadbearing cladding panels are being employed on even taller seven-, eight-, and nine-story dormitories and hotels. The loadbearing version of this strategy takes advantage of the many traditional benefits of the tilt-up building system. The non-loadbearing cladding method has its own set of advantages for certain applications. Woodland Construction Co., Inc. and Johnson Structural Group, Inc. have partnered on many projects employing this relatively unconventional strategy. The most recent application, and the subject of this article, is the Dual Brand Hilton Hotel at Dolphin Mall in Sweetwater, Florida just outside of Miami. The 11-story, 385,000-SF tower did not start out as a tilt-up structure. As the project was being redesigned from two separate hotel towers into one larger tower with shared back-of-house, the owner approached Gary Fischer, president of Woodland Construction Co., to discuss an alternative to the already planned construction system of post-tensioned concrete slabs with masonry infill walls. They were familiar with two other Woodland Construction projects for Florida Atlantic University (FAU) and were interested in discussing stacked tilt-up cladding for their project. 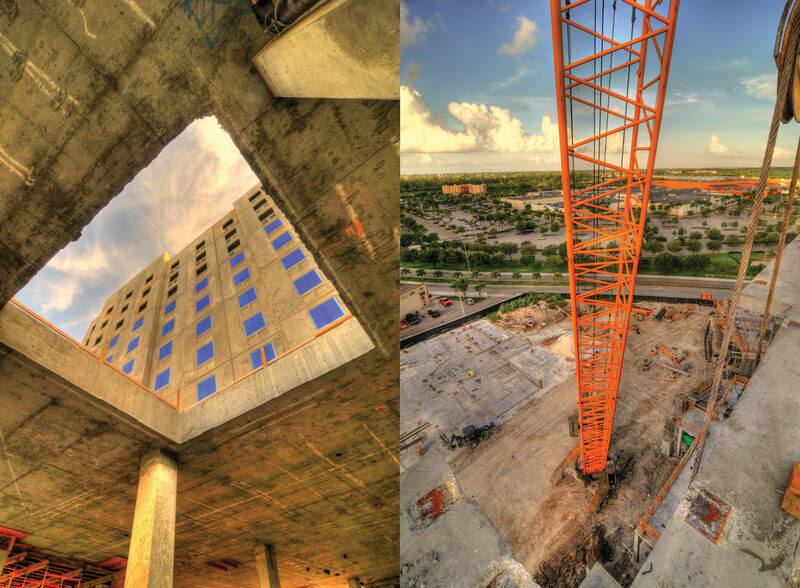 In 2010, FAU embarked on a $121 million project on the Boca Raton, Florida campus that included the seven-story Innovation Village Apartments. The 537,854 SF project employed non-loadbearing tilt-up cladding panels. The project was a mix of full height panels reaching 88 feet 9 inches and shorter vertically stacked panels (image below). More recently, FAU added another seven-story student housing project to their campus in Boca Raton. The 600-bed residence hall utilized cast-in-place interior columns and shear walls, and 9-in-thick post-tensioned slabs. This time, Woodland Construction and Johnson Structural Group decided to stack all of the panels. The tilt-up walls of the high-rise were constructed in three pieces, two-stories, three-stories, and two-stories high, stacked atop each other and designed as cladding. 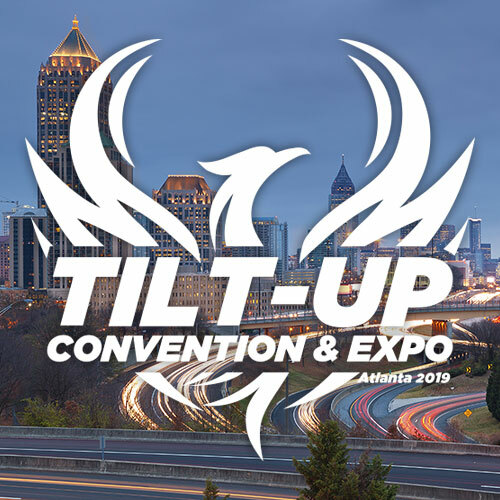 Being that the greatest stress a typical tilt-up panel may ever see is during lifting, stacking can dramatically reduce the weight and thickness of tilt-up panels. Naturally, a smaller or shorter panel is easier to lift than a larger or taller panel, thus requiring less thickness and reinforcement resulting in less weight. This can translate into savings in some cases and, in others, it can mean that a project not likely or even possible in tilt-up before can now take advantage of the benefits of the method. The 252 panels on the Dual Brand Hilton Hotel at Dolphin Mall range between 7in and 8in thick and average 25ft wide by 20ft tall. The largest panels on the project are 26ft wide by 48ft tall. 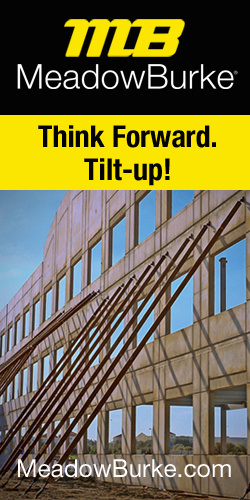 The tilt-up panels are supported through welded connections to the cast-in-place post-tensioned structural frame and are not directly supported from the building’s foundation except in certain areas. The first, or lower, lift of panels, which span from the first floor to the fifth floor, are hung from the second floor concrete structure and tied back to subsequent floor structures above. The upper level panels span two floors at a time, level five to seven, seven to nine, nine to eleven and eleven through the roof/parapet. Panels were cast in three sequences on temporary casting beds near the structure as the concrete frame of the building was being formed and cast. As portions of the concrete frame topped out, panels were ready to be applied to the structure. This sequencing allowed other trades access to lower sections of the building as upper sections were still being built, which is typical of high-rise construction. The sequencing was also a function of available casting space on a relatively tight site, which presented a challenge when it came to access for panel movement and other site activities such as deliveries. Panels had to be walked a good distance from the casting slabs to the structure. A second crane was employed as a shuttle to move panels from the casting area to their position, saving the larger crane from having to make the back and forth trip. Panels were picked utilizing typical lifting inserts on the faces of the panels. The crane was set up with two lines and two sets of rigging so that once the panel was broken free, the weight could be transferred, in midair, to inserts cast in the top edge of the panels. This allowed for plumb setting, as the rigging would be right up against the concrete structure. The exterior of the building features a variety of creative reveal/recess patterns that would have been difficult to execute had the project moved forward with concrete masonry infill walls. This is where the signature of multi-story tilt-up design is delivered. What is most unique for tilt-up construction is its ability to exist as its own style or to become submissive to a larger composition, exist as the canvas if you will. Tilt-up panels set as components to a building envelope afford the architect a vast palette of opportunities for nuanced, emulative or bold statements that deliver symbolic identity or iconic mystery. They are all further examples of the vast potential tilt-up delivers when combining construction and structural efficiency with fluid creativity. 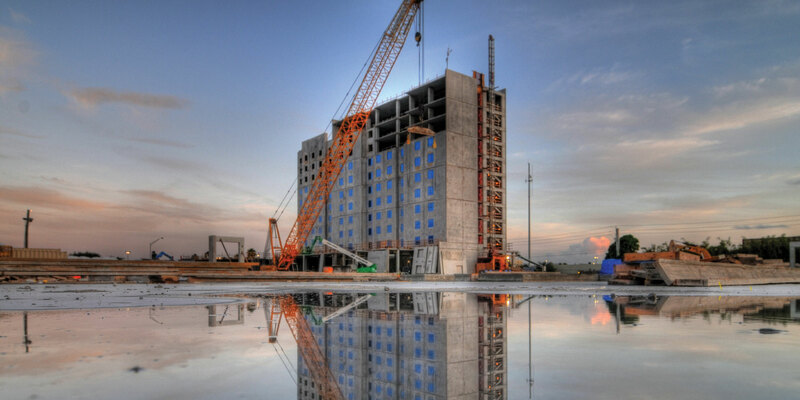 What is the major difference’s from stacking tilts to precast other than casting onsite ? The differences come from the fact that they are cast onsite. Size of panel, control of sequencing (time and money savings), etc.